As the world commemorates the 70th anniversary of the victory over the forces of Nazism on May 9, particularly the Soviet Union’s stellar role in the Great Patriotic War, it would be apt to also remember sacrifices of the valiant Indian soldiers who fought alongside and spilled their blood for that cause. On May 9, as the world marks the 70th anniversary of the great Victory over Fascism and Nazi Germany in World War II, it would be apt to remember sacrifices of the valiant Indian soldiers, who also spilled their blood to make this possible. India was not an independent country, yet its soldiers enlisted in the thousands to help the Allied war effort. There is no doubt that the greatest sacrifice in defeating Fascism was made by the Soviet Union, which lost 27 million people in the “Great Patriotic War” against Nazi Germany and liberating countries of Eastern Europe. This was the bloodiest chapter of the World War II, in Eastern Europe, which hardly left a single Soviet family unaffected across the huge nation. Nazi troops invaded the USSR on June 22, 1941, radically changing the very logic of the war, which had so far been mostly confined to Europe and North Africa. Unfortunately, large parts of the common efforts against the common enemy were wilfully forgotten in the ‘Cold War’ which followed the Great War, between the former allies of the West and the East. A largely unsung episode of the joint collaboration during World War II was Operation Countenance, the British-Soviet invasion of Iran to secure the Persian Corridor for unhindered supplies to the Soviet Union by its British and US allies. Thousands of Indian soldiers took part in this operation which lasted from August 25 to September 17, 1941, as German Panzers were rolling towards Moscow. 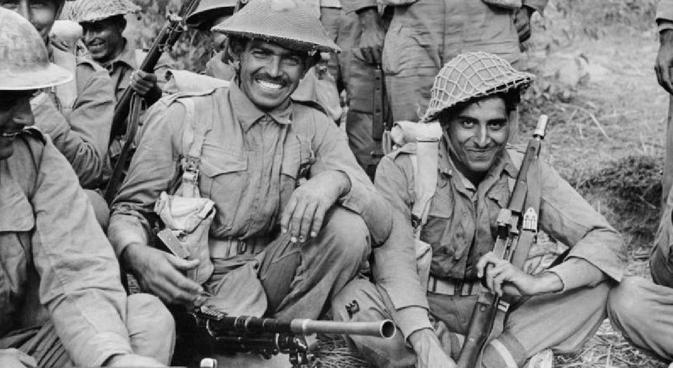 The British Persia and Iraq force (Paiforce) was mostly made up of the 8th and 10th Indian Infantry Divisions, 2nd Indian Armoured Brigade and the 21st Indian Infantry Brigade. Military convoys driven by Indian drivers delivered arms and food supplies across Iran into the Soviet Union right up to Beslan (Russia’s North Ossetia) and present-day Turkmenistan’s Kizyl Arvat. After war many Indian servicemen and military drivers were decorated with Soviet medals and orders. In India, the political discourse about the assessment of WWII remains mired in the controversy over the ‘Quit India’ movement launched by the Indian National Congress against the British Raj (empire) by refusing to support the “Imperialist war,” but after the Nazi invasion of the Soviet Union, the Indian Communists declared it a “People’s war” and actively mobilised its backing for the British Indian Army. Communists and Soviet sympathisers joined the Indian Army in strength, which swelled into the world’s biggest voluntary army, of 2.5 million people, by the end of World War II in 1945. One of the leaders of INC, ‘Netaji’ Subhash Chandra Bose chose the path of siding with the British enemy - Axis of Germany and Japan and raised the Indian National Army (Azad Hind Fauj) by recruiting Indians taken as prisoners of war (PoW) by the Japanese. This added another dimension to the assessment of WWII in the Indian political discourse. This dissonance has led to ignorance of the Indian contribution in Allied victory in WWII and India’s claim to a rightful share in the creation of the post-war world order, including a permanent seat in the United Nations Security Council. The dissonance and lack of clarity placed the then Congress government of Prime Minister PV Narasimha Rao in a dilemma when, in 1995, Russian President Boris Yeltsin invited him, with other world leaders, to attend the 50th anniversary celebrations of the victory over Nazi Germany at Moscow’s Red Square. India sent the then External Affairs Minister, Pranab Mukherjee, while the western presence was led by US President Bill Clinton and a galaxy of world leaders. “Well, this is not exactly our victory,” was the official Indian position at the time. However, there is a greater understanding today of the Indian role and the country’s political elite has been acknowledging the contribution of the 2.5 million Indians who played a significant role in facilitating this day of victory in the bloodiest war in Europe. Prime Minister Manmohan Singh represented India at the 60th anniversary celebrations of the Victory in the Great Patriotic War in Moscow in 2005. Ten years later, on May 9, 2015, Pranab Mukherjee will again represent his country, this time in his capacity as the President of India. In a first, President Mukherjee will also watch 71 Indian Grenadiers marching at the Red Square, alongside Russian armed forces, during the Victory Day parade to commemorate the 70th anniversary in Moscow. This will be seen as a tribute to the 87, 000 Indian military personnel who died in action during WW II, and up 2.5 million civilians who perished in India due to famine and other war related privations.